This beautiful young woman out with her family in Balboa Park late this afternoon sucked Kongo in. He admits to stalking her, patiently waiting for just the right setting and background. Just as the light was leaving, she stood alone with the big fountain in the background and the monkey snapped this image. 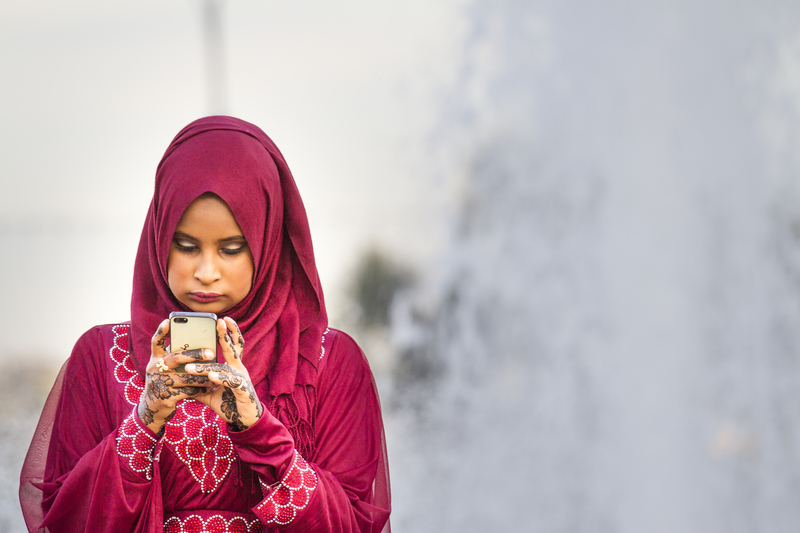 He likes the color of her garb, the henna on her hands, the concentration on her face, and the iPhone. Cool pic – love the composition! Excellent. Love the composition and the subject. Nice. I always wonder if photographers tell people they snapped shots of them, but it’s a very nice colourful shot. I think you pose a good question and to me the answer is “it depends.” This was taken with a 70-200 lens so it wasn’t close and I wasn’t “in their space.” It was a very public place so I had every right to take a picture of whatever I pleased and she and her family had been busy taking pictures of each other earlier. There was also the fountain in the background which is a very photographed object. I have often asked people if they mind if I take their pictures when it is obvious that I am doing so. Especially children…always ask a parent if it’s okay to snap their little ones. In this case it didn’t make sense to push through a crowd of people and ask someone 50 feet away if it was okay to take their photo. I think you have to play these by ear. Of course, if I was planning to use this image for commercial purposes I would have sought a release but that’s not the case here. Do you think that you should always inform someone if you take their picture? Well, I am not quite sure. This is the reason why I have never dabbled into street photography or portraits. I tried to think about it the other way around: “Am I okay with people taking my photos as part of a photo essay or blog post?”. My answer may be yes, but others may not share that same mentality, especially that I am living in Egypt and people are not as open-minded here as they in other places. I am quite confident Kongo would love Egypt and hopes to visit there some day soon. The point you raise here really cuts to the heart of the issue. It’s all about context. In the USA or other Western countries there is probably much less of an issue about taking “street photography” that perhaps in other parts of the world. Cultural mores and prevailing attitudes are important to keep in mind while photographing strangers. Sometimes the act of asking if it’s all right to take a photo spoils the image you’re trying to get…suddenly the person is not acting naturally and are very aware of the camera. Other times it doesn’t seem to matter. Crowded places seem to me to be okay to shoot away. More solitary encounters perhaps requires some sort of communication. Often Kongo just points to his camera and to the person, they smile, and he shoots away. He often gives out email addresses to forward images to those who want them. I hope you try it in Egypt but of course you want to be safe in your surroundings, particularly with the troubles there now. Good luck! Thanks a lot 🙂 I’ll let you know when I publish it. I guess we’ve all stalked a time or two…..nice work detective. Hey, Jenny. Thanks for the likes and for contributing to the conversation. My view is that if you’re at a stage of your photography where you’re starting to get serious about your images, then deciding how to deal with strangers in different settings is something you need to figure out. I agree with you that context and culture are really important factors in figuring out how to go. Almost everyone I’ve asked permission to photograph on the “street” has said yes. Enthusiastically. They’re flattered that you find them interesting. There are some, in places like Little Italy or Chinatown in NYC where they wave you off. These folks have been so overshot by hordes of photographers that they just have had enough. Plus, maybe they don’t want you taking their picture for other reasons…like maybe they’re involved in something they shouldn’t be. If I’m asking permission then I will then want to work with that person a bit, get them into better light maybe, or move them away from a distracting whatever in the background. In this case I basically was just waiting for this young woman to get in a position where there weren’t a lot of people between my camera and her and I didn’t want to pose her or anything…I needed her to be natural just the way she was. In retrospect perhaps I should have approached her afterward, given her my card, and told her I’d be happy to provide any copies of images if she provided an email address. I often do that. I just didn’t this time. I really wasn’t engaged with her except to get her into my viewfinder.